A second version of the Diagnostic Trouble Codes known as OBD-II ['On-Board Diagnostics'] were introduced during MY 1996. These codes are used in the electronic monitoring of nearly all engine controls plus certain other parts of the vehicle such as the chassis and body. OBD allows you to read information from the vehicle usually using a plug-in diagnostic tool to read fault or error codes. Unfortunately, you usually need a PC, Handheld (see image right), manual or other reference to find out what the codes mean, especially with the manufacturer-specfic codes. Here is a reference to the more common fault codes, both generic and Jaguar-specific. Use your browser search function to find your code below (if we have it). These codes are being added to all the time - if you have additional ones not shown here or have corrections, please let us know via 'helpme at jag-lovers.org'! 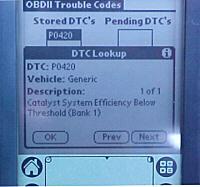 You can find lots more information about OBD-II in general at The OBD II Homepage. You are advised not to replace any part based solely on a DTC. Detailed test instructions can be found in your car’s service manual and this will have testing procedures for every DTC with instructions plus flow charts which will confirm the problem's location. Note that we do NOT guarantee the accuracy of the codes shown here and you should double check the information before acting on any diagnostic code. You need to be a Registered Jag-lovers member and have Donated to view the OBD-II code listings.